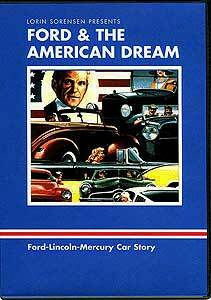 Ford and the American Dream DVD by Lorin Sorensen. For many Americans in the early days of motoring, Henry Ford's amazing Model T was the first car they had ever seen, ridden in, driven or owned. Each generation has had its own love affair with Ford carsfrom the legendary Model A to the fast and famous "flathead" V-8s and all the beautiful Fords, Lincolns, Mercurys, Thunderbirds...the incomparable Mustangs...and so many other great models. Along the way they have been the family joy, polished, paraded, raced, hot-rodded, customized and collected. Narrated by veteran Ford voice Shelby Newhouse and written and produced by auto historian Lorin Sorensen for a 1991 Ford marketing program this is the entertaining story of some of the best of those Ford produced cars and historic events, compiled from the very best of the original historic film footage. Coverage is from the. '20s to the '80s. running time: 50 minutes, black & white and color, sound. © 1990, 05 Lorin Sorensen. All rights reserved.